Accumulations of iron, manganese, and arsenic occur in the Chandina alluvium of southeastern Bangladesh within 2.5 m of the ground surface. These distinctive orange-brown horizons are subhorizontal and consistently occur within 1 m of the contact of the aerated (yellow-brown) and water-saturated (gray) sediment. Ferric oxyhydroxide precipitates that define the horizons form by oxidation of reduced iron in pore waters near the top of the saturated zone when exposed to air in the unsaturated sediment. Hydrous Fe-oxide has a high specific surface area and thus a high adsorption capacity that absorbs the bulk of arsenic also present in the reduced pore water, resulting in accumulations containing as much as 280 ppm arsenic. The steep redox gradient that characterizes the transition of saturated and unsaturated sediment also favors accumulation of manganese oxides in the oxidized sediment. Anomalous concentrations of phosphate and molybdenum also detected in the ferric oxyhydroxide-enriched sediment are attributed to sorption processes. 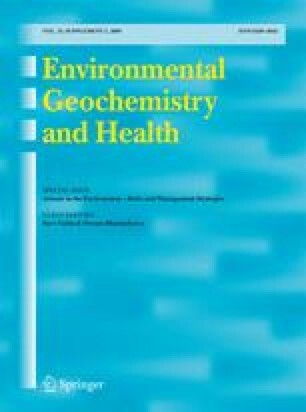 The authors are grateful to Dr. Christoph Berthold, Department of Sedimentology, University of Tuebingen, Germany; Dr. Jorn Breuer, Institute of Agricultural Chemistry, University of Hohenheim, Germany; and Mrs. Renate Riehle, Institute for Geology and Paleontology, University of Tuebingen for their kind support in performing laboratory analyses. The German Academic Exchange Service (DAAD) and Bangladesh Water Development Board are gratefully acknowledged, respectively, for providing a research fellowship to the first author to perform laboratory work in Germany and allowing the research to be carried out. Stollenwerk, K. G., Breit, G. N., Welch, A. H., Yount, J. C., Whitney, J. W., Foster, A. L., et al. (2007). Arsenic attenuation by oxidized aquifer sediments in Bangladesh. The Science of the Total Environment. doi: 10.101016/j.scitotenv.2006.11.029. Zahid, A., Balke, K.-D., Hassan, M. Q., & Flegr, M. (2006). Evaluation of aquifer environment under Hazaribagh leather processing zone of Dhaka city. Environmental Geology. doi: 10.1007/s00254-006-0225-1.